Craving a yummy salad? This easy Pomegranate and Pear Salad is drizzled with pomegranate vinaigrette and studded with goat cheese. It’s great all by itself or topped with grilled chicken! I obsess over a good salad. It’s actually one of my favorite things to order when we go out to a restaurant. Even it’s something as simple as a wedge salad I’m all about it. 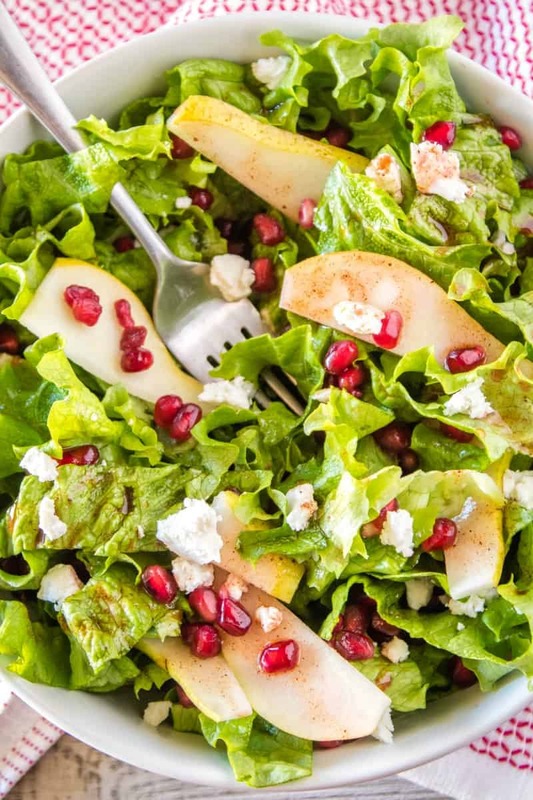 This Pomegranate and Pear Salad is at the top of my list for easy to home salads. It’s crazy simple but all the flavors work wonderfully together. You can dress it up or dress it down depending on your mood, and all those pomegranate arils make it so pretty! The first time I made this salad was for Valentine’s Day years ago. Mike and I aren’t crazy about the holiday or anything, but I like to make a nice dinner for us and this salad was the first course. I followed it up with shrimp and lemon risotto. Yum! Anyway, I’ve made this salad again and again and I think I have it down to a science now. While the pear salad dressing stays to same, I mix up the toppings depending on what I’m craving. This pear salad always tastes awesome and the dressing lasts in the fridge for a while. So what’s up with these topping options? Glad you asked here are some of my favorite variations. 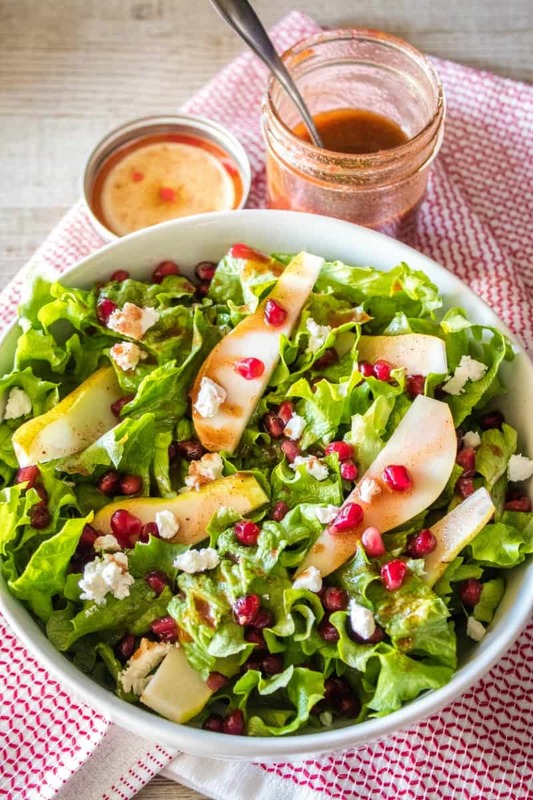 Start with pomegranate arils, pears (sliced or chopped), and pomegranate dressing then mix and match to your taste! All these combinations go well with the spiced dressing, pears, and bright tart arils. The goat cheese and spinach with grilled chicken has become my go-to for lunch recently. Mike comes home everyday asking if I had my pear goat cheese salad for lunch or if we can go out. It’s an addiction! A note about the pomegranate arils. You can buy them already out of the pomegranate at most grocery stores, or you can buy the fruit and remove the seeds yourself. Split the pomegranate in quarters, hold under water in a bowl and use your fingers to break apart the fruit and removed the arils. They also make aril removal tools if you’re not so sure about doing things 100% on your own. It takes a little practice the first time, but it’s not hard to do and you can’t mess things up. Craving a yummy salad? 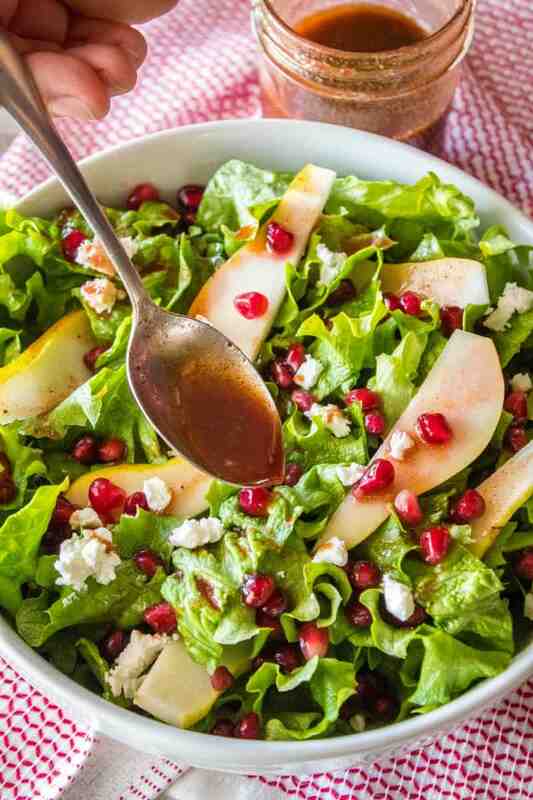 This easy Pomegranate and Pear Salad is drizzled with pomegranate vinaigrette and studded with goat cheese. It's great all by itself or topped with grilled chicken! To an 8-ounce mason jar add pomegranate juice, olive oil, vinegar, sugar, cinnamon, ginger, and salt. Top with lid, close tightly, and then shake vigorously to combine. Chop rinsed lettuce into bite-sized pieces. Add to a large mixing bowl. Drizzle lettuce with a couple tablespoons of vinaigrette and toss to coat. 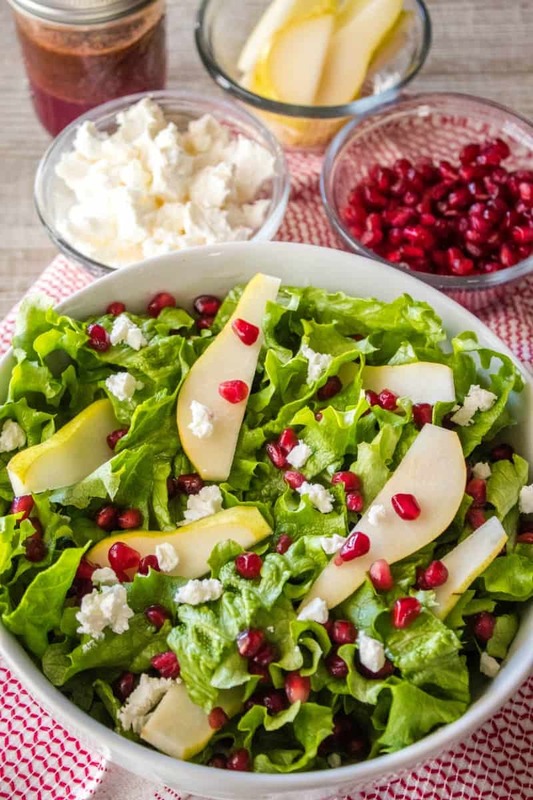 Top with pear slices, pomegranate arils, and goat cheese. Toss to combine. Add more dressing to taste. Divide into 2 small salad bowls for side dish portions, or serve as is for main dish portion. I like to add grilled chicken to my salad and make a meal of it. This recipe makes 2 side servings or 1 main dish serving. 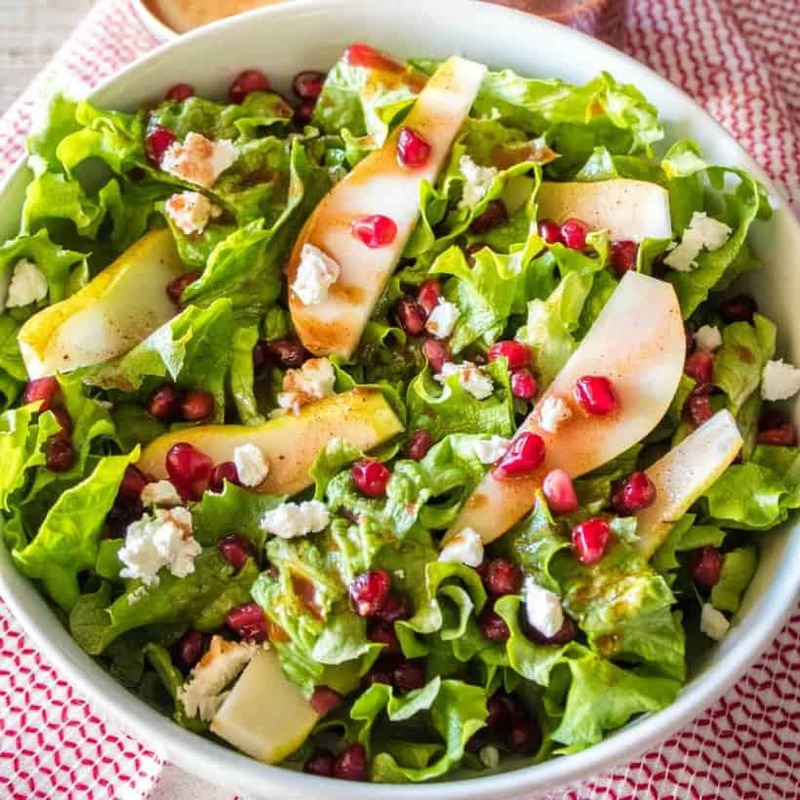 You can use your favorite type of pear and goat cheese for this salad. The nutritional information for this post accounts for ALL of the dressing being used on your salad. You totally won't use all the dressing.